Adapted and arranged by Lauren Fairbairn, poems by Rob Fairbairn. Suitable for students in middle to upper primary school. Charles-Camille Saint-Saens’ immortal treasury of whimsical pieces has been brought to the classroom in this elegant collection for descant recorder! It contains 12 pieces, each with 3 parts and an accompanying poem. With the recorder parts and the reading of the poems – you have a great, ready-made concert item. Add some dancers to perform appropriate movements and you can make it even better! In addition to the photocopiable book and CD, a piano score and backing CD is available for purchase. 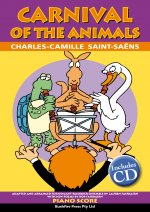 Here is a copy of the contents page for Carnival of the Animals which includes all song titles.